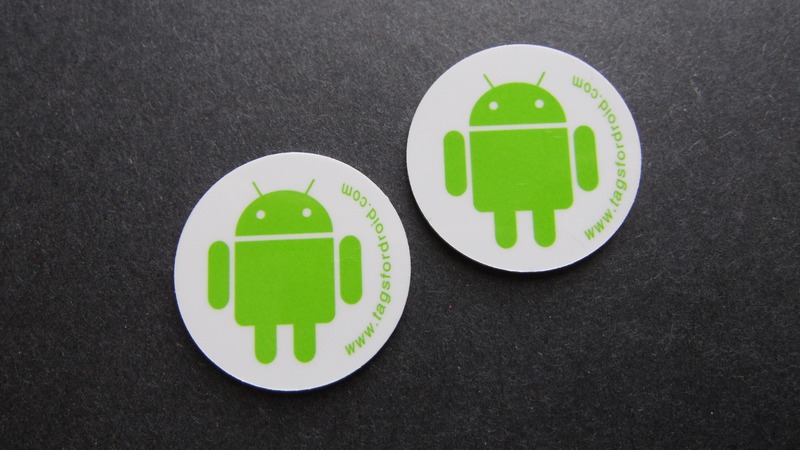 More and more devices are becoming available with NFC - but what does that actually mean? 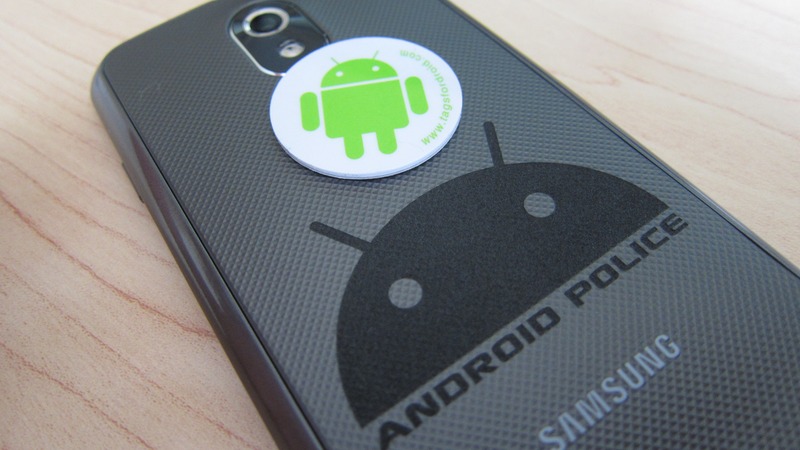 First and foremost, NFC stands for near field communication. Basically, when you get your device close enough to something equipped with NFC - like a tag or a mobile payment center - it invokes an action on your device. Google Wallet is a perfect example of NFC in mainstream use; simply touch your phone to the payment terminal and the rest is done for you. 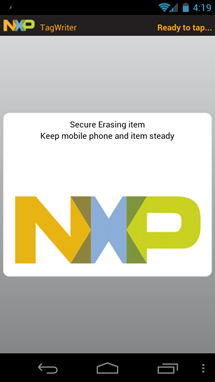 There are more practical applications to using NFC than just Wallet, though. Another good example of this is a feature in Android 4.0 called Android Beam. 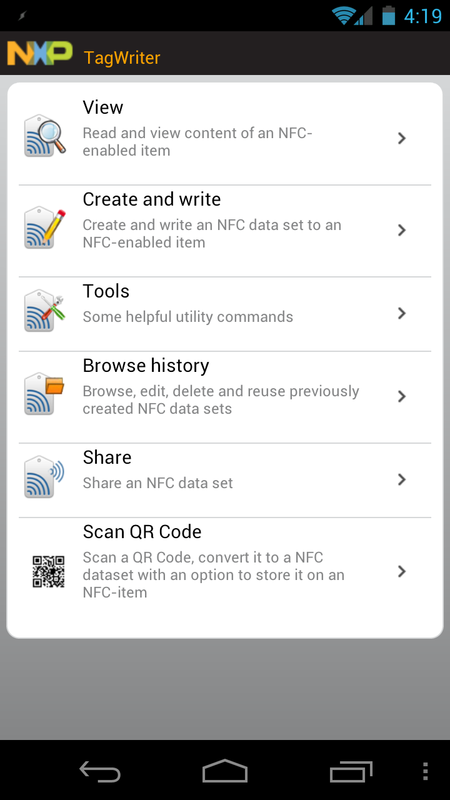 This allows two NFC-equipped phones to send data to one another simply by tapping them together. 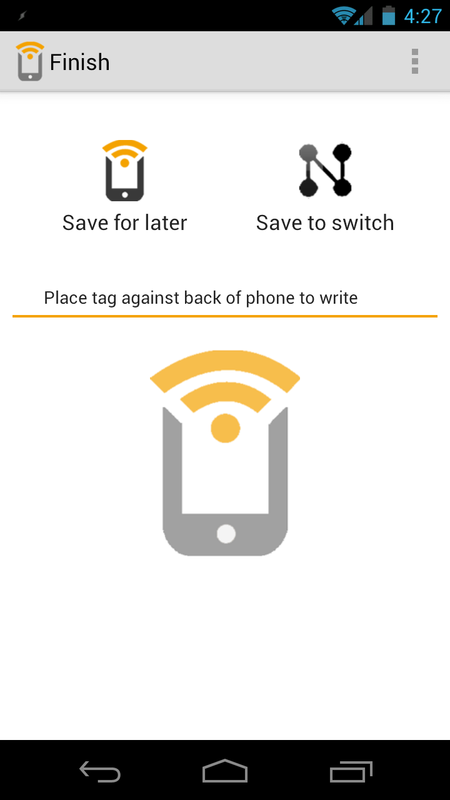 Another fantastic, and much more customizable, use for NFC is the ability to write (and re-write) tags used for executing user-specific commands. 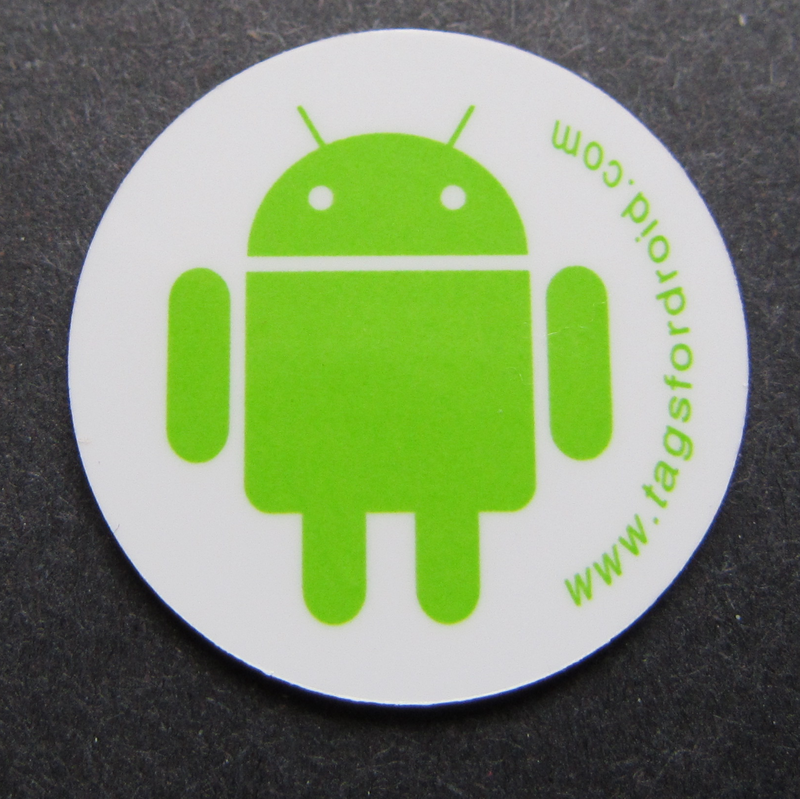 One provider of such tags, Tags for Droid, offers incredibly affordable tags - only $11 for five, $16 for 10, or $26 for 20 - with a nice little Bug Droid logo on them. Perfect for showing your iOS buddies what's up with NFC. I've been using these NFC tags to automate simple tasks for the better part of a month now, and I have to say - it's pretty great. 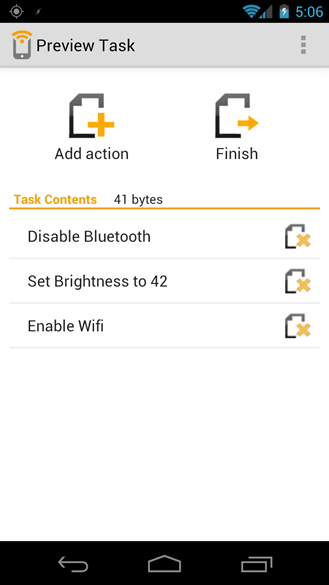 I also use Tasker for certain things, but when combined with the power of NFC, the pair can accomplish nearly anything. 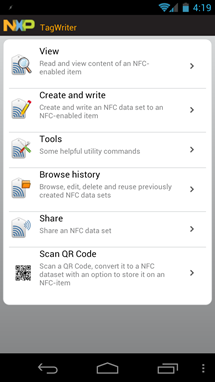 With that, let's take a closer look at the apps that I use and how I have my NFC tags setup, shall we? 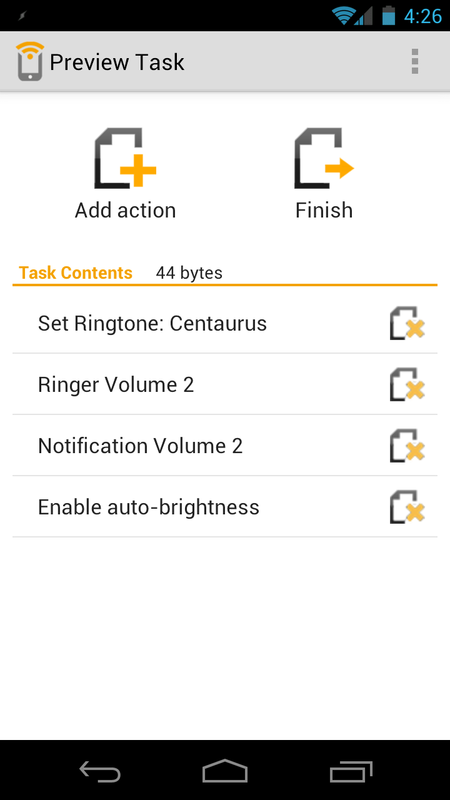 First things first - you need an app that can create tasks and write them to the tags. This is really where the first quirk comes into play; with Android 4.0.2 (current stock on the LTE GNex), you actually need two apps. One to format the tags, and another to create them. While this is an issue that I encountered, it has been remedied in Android .4 (which should now be available on the GSM variant, as well as the Nexus S/4G). 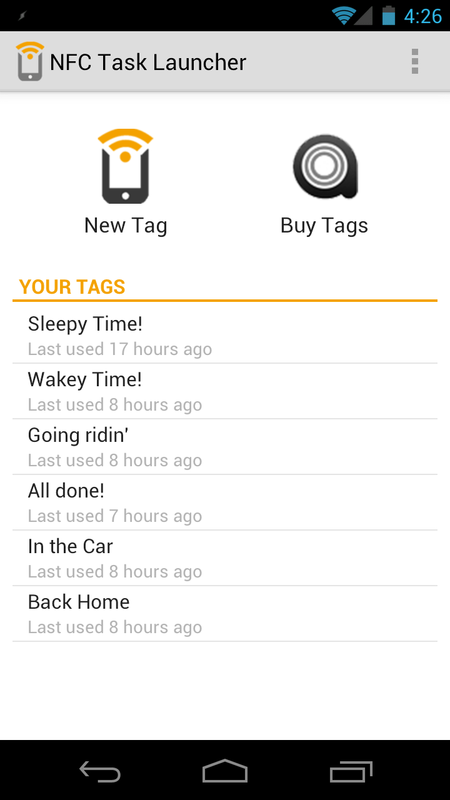 I use TagWriter for one reason, and one reason only: to format the tags. As you can see, I've already setup a few switches here. What's a switch, you ask? 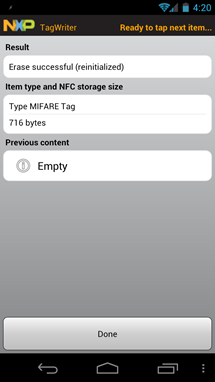 In a nutshell, it's a command that you can write to an NFC tag. For example, you can write an "intro" switch that, when tapped, executes a certain command (or series of commands). Then, if you tap the switch again, it can execute a different command (or series). We'll get into that a little bit more later. Anyway, back to the app. NFC Task Launcher is a very easy-to-use app for writing data onto the NFC Tags. It can write a number of toggles, including Wi-Fi, Bluetooth, and airplane mode; as well as change sounds, volumes, and vibration settings; modify alarms, toggle tethering, check-in with social apps, Tweet something specific, launch applications, modify display settings (brightness, etc.) 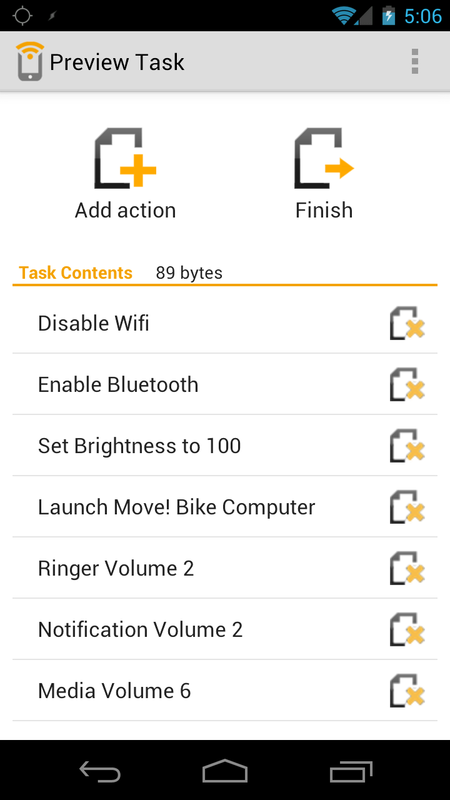 and even execute Tasker tasks (which is awesome). 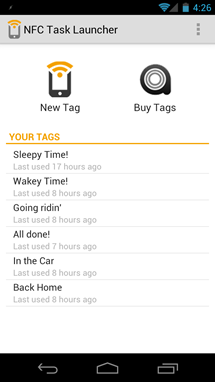 Now that you know what we're using, let's take a closer look at the tags and how they work, as well as some simple tasks that I use everyday. The tags have an adhesive backing so you can stick them in whatever location is most convenient. If, however, you need them to be more 'mobile' or you may not want them in the same location all the time, you can always stick the tag to a piece of cardboard (or something similar) and make a hanging tag similar to Sony's Xperia SmartTags. I've setup my tags to perform relatively simple, yet incredibly useful tasks. 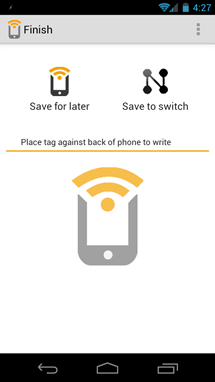 Here is a look at three examples tags that I use on a daily basis, as well as how they're setup. Obviously, this is the tag by my bedside that I hit before going to sleep and when I wake up. First, it changes my ringtone to something a bit more... subtle (I normally switch between the chorus of Demon Hunter's The World is a Thorn and The Devil Wears Prada's Escape as my normal ringer, neither of which are pleasant to wake to in the middle of the night), as well as turning the ringer and notification volume down to 2 and enabling auto-brightness. Like I said - it's a simple task, but to do those things manually would be far more tedious than tapping a simple tag. When I wake up in the morning, I simply tap the tag again to execute the second switch. That launches my 'Home' profile in Tasker, as well as sets the brightness to 40-ish (which is where I leave it most all the time) and sets my ringtone back to whatever it was before initiating the first trigger. It's so simple, yet so useful. Next up is the tag on my bicycle. I usually like to start my day off with a ride, so having a tag that toggles some radios and launches some apps is a must. As you can see, my phone is a key part of my morning ride. After hitting my bike tag, I drop my phone into my bar-mounted phone holder (review coming soon), turn on my Bluetooth earbuds, and I'm ready to hit the pavement. I don't like to be bothered with notifications or calls (but I still want to know when they're incoming), so those volumes get dropped. With all of the volumes, brightness, and radios just the way I like them, Move! Bike Computer is launched and I start to record my ride. What used to take several minutes to set up before I got started with my morning workout is now just a simple tap. And it's awesome. Once I get back home, I tap the tag again , executing the second switch. 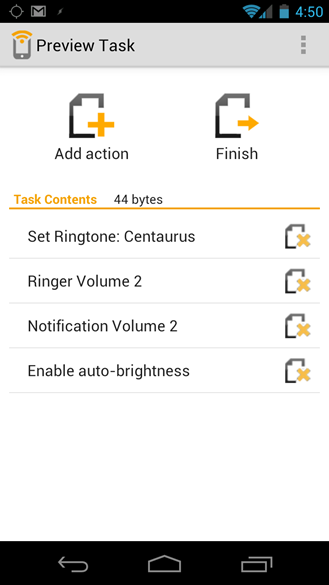 Once Wi-Fi turns on and connects to my home network, a Tasker task is executed that changes the ringer and notification volumes back to 4 and disables vibrations. Really, the only thing that I have to do manually is end recording in Move! and exit the app. I can live with that. This one is the simplest of all the tags I have, and it's the only one that doesn't have a multiple switches. I usually tap this tag before I even leave the driveway, so it disables Wi-Fi, turns the media volume up to 13, and launches Google Music. I don't use Navigation a lot, so that would be a superfluous feature to add; however, I may create a second switch on this tag that would launch navigation and a few other things for those instances when I do need directions. 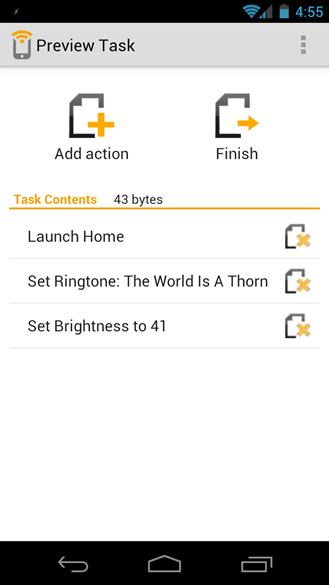 Since I use Tasker to automatically turn Wi-Fi on when I get home and launch a specific task as soon as it's connected, there is no reason to add a second "I'm home" switch for this tag. 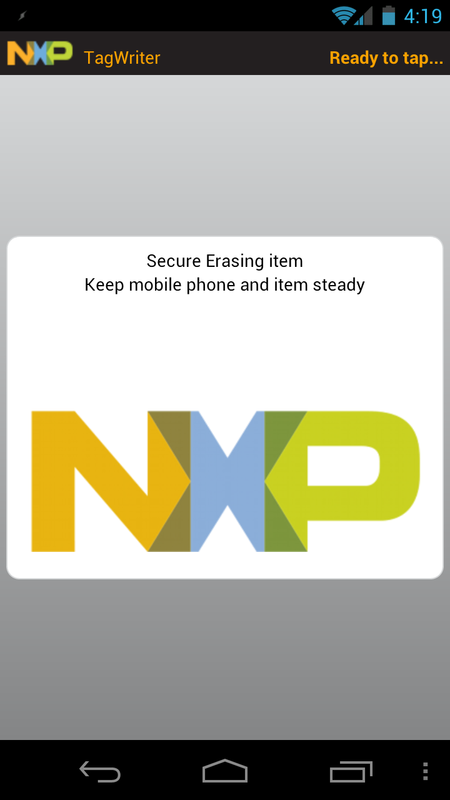 As you can see, NFC isn't just a novelty feature. 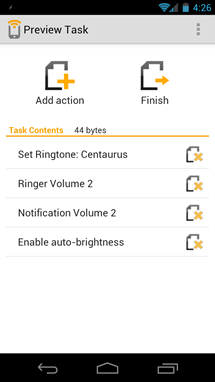 There is real practical application involved here, and when combined with the power of Tasker, there are few limits to what you can actually accomplish. 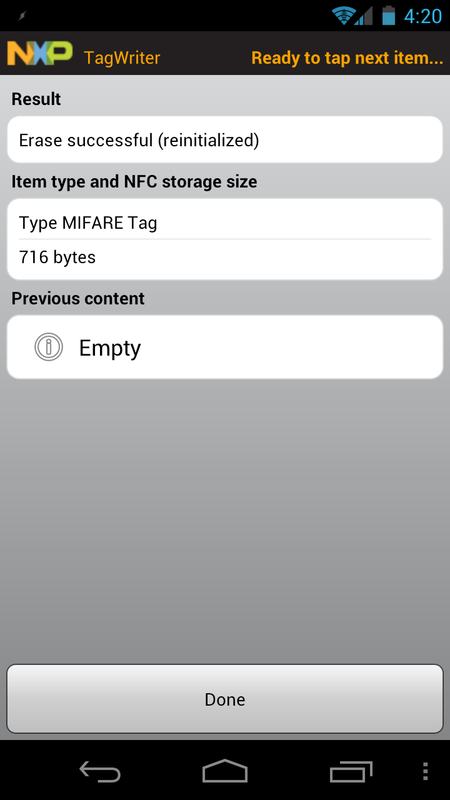 The examples I've given are among some of the more basic ideas, but if you have an NFC equipped phone, I highly recommend picking up some tags and experimenting. If you want to pick up some tags of you own, you can get them here.